OXFORD, Miss. 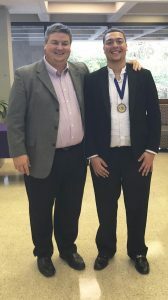 – Several University of Mississippi music majors competed at the annual Mississippi Music Teachers National Association Competition recently at Millsaps College in Jackson, with one student taking top honors in his category. Christopher Scott, a senior music major, won the Young Artist Solo Woodwind Performance category. This win advances him to compete in the Southern Division MTNA Young Artist Woodwind Competition representing Ole Miss in January at Liberty University in Lynchburg, Virginia. Scott performed four pieces during his winning performance, including works by Giovanni Benedetto Platti and Takashi Yoshimatsu. “Every member of the music faculty here at the University of Mississippi has been valuable to helping me prepare for this audition,” Scott said. He particularly credited Adam Estes, assistant professor of music, and Stacy Rodgers, associate professor of music, with being significant in his growth and maturation as a musician. Other institutions competing at the event were the University of Southern Mississippi, Mississippi State University and Jones County Junior College. Besides Scott’s win, the Ole Miss Saxophone Quartet received an Honorable Mention in the Woodwind Chamber Music Competition, and Austin Brooks earned an Honorable Mention in the Senior Woodwind Solo Performance. Estes said he believes that Scott and Brooks both peaked in their competition performances, and that the rest of the Ole Miss students who performed represented themselves and the university well. “I am proud of all the students who competed, both those who received placings and those who did not,” Estes said. “For the students, receiving medals and honors help validate the work that they are doing.